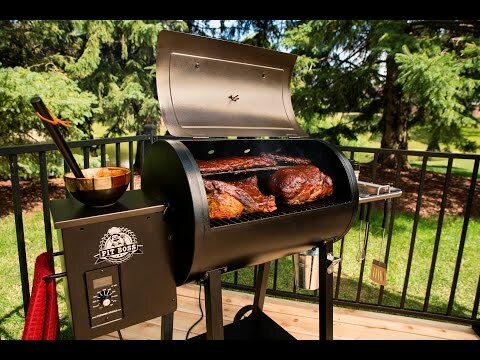 Get ready to grill, bake, smoke, roast, sear, braise, char-grill, and BBQ with all-natural hardwood pellets that give your food authentic, wood fired flavor on the Pit Boss 440 Deluxe Pellet Grill. This deluxe model features a copper finish on the hopper lid and rear venting, directing smoke away from the grill master. The 440 Deluxe has 440 square inches of grilling space with 340 square inches on the main grid level and 100 square inches on the upper rack, both made of porcelain coated steel. Dial in your desired temperatures as low as 180 degrees for low and slow and as high as 500 degrees for fiery and fast cooking. The LED readout allows you to set your grill temperature and forget about it while the grill does the work by monitoring temperature and feeding wood pellets into the burn pot where they will be ignited. You can keep an eye on the internal temperature of the grill with the built-in dome thermometer while you crack open a beer with the built-in bottle opener. The curved flame broiler gives the food drippings more time to sizzle adding flavor back to your food, while also directing the run off grease into a grease bucket. There is a simple slide plate that, when closed, allows you the option of indirect, smoker-style cooking perfect for smoking and baking. When the flame broiler is slid open it gives you direct flame grilling, creating the ideal set-up for beautiful seared steaks and flame kissed burgers. The Pit Boss 440 Deluxe also has a fan forced convection system that circulates air throughout the cooking chamber creating an even temperature throughout the grill, and removes the need for a rotisserie. Heavy duty steel construction is finished with a durable powder coating made to withstand high cooking temperatures. This grill will reach up to 40,000 BTU. The hopper is able to hold up to 5 lbs of pellets and includes a safety grid. The Pit Boss 440 Deluxe will need a standard 120-volt outlet to power the reliable 200-watt electric auto igniter and the automatic start and cool down cycle. The side shelf comes with tool hooks for easy cooking and the bottom shelf adds stability to you cart while also adding more storage space. This grill also features a pair of large, heavy-duty caster wheels for easy rolling, a removable flavor guard for simple cleaning, a pellet clean out door so you can keep your unused pellets protected and dry between uses, and a removable stainless steel side shelf that doubles as a serving tray. Cooking Grid Dimensions 22 X 15 1/2"
The Pit Boss wood pellet barbecue line, manufactured by Danson Inc., carries a one (1) year limited warranty for from the date of sale to the original owner only against defects and workmanship on all steel parts, (excluding the burn pot and flame deflector), and one (1) year on electrical components. There is no specific warranty on the paint, burn pot, grill cover, probes, all gaskets or against damage caused by corrosion. More details in your owners manual. 22 X 15 1/2" 20 X 15" 22 X 19" 22 X 19"